Antonio Morales (The Athletic) — LOS ANGELES — Jack Sears’ pass floated in the direction of one of USC’s walk-on receivers toward the end of Saturday’s practice. Sophomore safety Talanoa Hufanga, whose freshman season was cut short by a broken collarbone and who has worn a yellow non-contact jersey this spring, got tangled up with the receiver while in coverage, fell to the ground and stayed there for a few moments while athletic trainers and Clay Helton came to check on him. 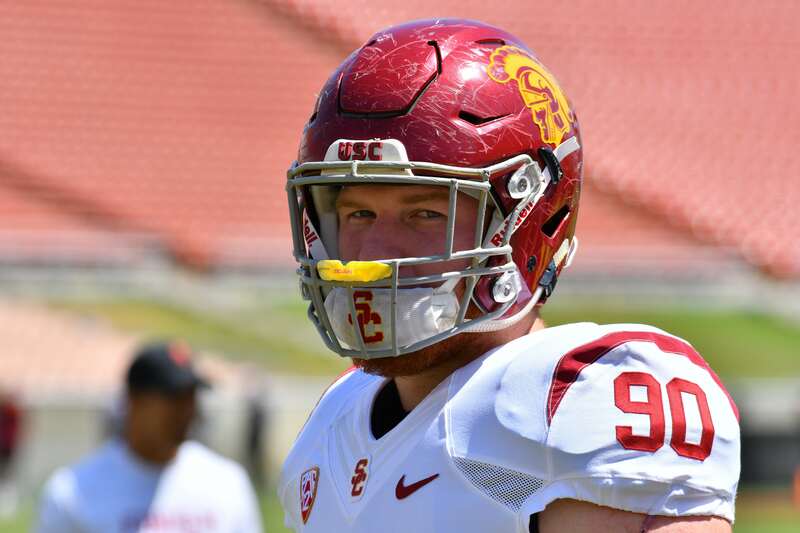 It was a scare for one of the Trojans’ most talented defensive players, but it also displayed the tightrope the Trojans are attempting to walk this spring. You want to get players, especially younger ones like Hufanga, some valuable reps, but at the same time, you have to preserve your depth. Hufanga was one of two scholarship safeties who were able to participate in practice this week. USC also practiced with one scholarship running back for most of the week and three scholarship corners. When asked about Hufanga, who favored the right shoulder he injured last year, Helton was in wait-and-see mode. Running backs Vavae Malepeai and Stephen Carr both missed Tuesday and Thursday’s practices with the flu. They returned Saturday but did very little contact in practice. That left Stepp with a heavy workload throughout the week. He impressed by bowling over defenders and breaking through tackles Saturday. The 6-foot, 230-pound Stepp is USC’s “big back.” Last season, he carried the ball seven times for 33 yards. Five of those carries came in the season finale against Notre Dame when the running back depth started to dwindle. With the graduation of Aca’Cedric Ware, last season’s starting running back, it’s logical to assume Stepp will be more of a factor in the running back rotation this fall. Through four seasons, Murphy, a 6-foot-7, 268-pound junior defensive lineman, has had a relatively quiet career with the Trojans, never recording more than six tackles in a season and redshirting last year. Though it’s still early, Murphy said he’s received an ego boost this spring. USC’s defense is utilizing four down linemen more often than it did last season, and as a result, Murphy has often worked with the first-team defense through the first two weeks of spring ball. The highlight of Murphy’s spring, so far, came on the final play of Thursday’s practice. The offense and defense were competing in a goal-line drill, and through eight plays, each side had won four plays apiece, which left everything to one decisive play. JT Daniels took the snap, dropped back and threw the pass, only for Murphy to bat down the ball at the line of scrimmage and give the defense the win. The first thing Kauha’aha’a emphasized with Murphy was gaining weight. USC’s defensive line coach is a stickler on maintaining weight and holds his players accountable on that topic. He has a goal weight for most of his linemen, and the target is plus or minus four pounds. Murphy said he doesn’t feel any slower with the added weight. There’s still a long way between now and Aug. 31 against Fresno State, and Murphy has plenty to prove, but so far he’s positioned himself well. Drake Jackson’s decision to pick USC over Arizona State in the early signing period this past December came down to the final minutes. The early returns have been promising. Christian Rector has class on Thursdays, which allows Jackson, a 6-foot-4, 260-pound edge rusher, to run with the first-team defense. Jackson, a former four-star prospect, did just that Thursday and held his own against the first-team offensive line. Jackson, who intercepted a tipped pass (then fumbled) in Saturday’s practice, has been working with the first- or second-team defense since the start of camp, so it’s clear the staff has confidence in him. He’ll likely be a factor in the rotation this season if things keep progressing. Kauha’aha’a said where Jackson has separated himself is the time he’s put in mentally, watching film and asking questions off the field. Listed as a defensive lineman and an outside linebacker, Jackson has the ability to stand up or put his hand down on the line of scrimmage. With the loss of Porter Gustin, last year’s leader in sacks, USC will take some pass rush wherever it can be found. He reiterated much of that when he was asked if he seriously contemplated leaving the program. The fact of the matter is USC needs bodies at defensive back in the worst way, so Johnson’s return is a positive. On paper, the decision to enter the portal didn’t make much sense considering he’d likely be a starter this spring. Johnson, who underwent shoulder surgery at the end of last season, is the Trojans’ only corner who has started a game and is available to practice this spring, which means the redshirt sophomore is the team’s most experienced option. After returning to the team for its second spring practice, he hasn’t taken long to get those first-team reps.
Johnson still has to wear a yellow non-contact jersey at practice because of his shoulder injury from last season, but he and Isaac Taylor-Stuart are the first-team corners at the moment. True freshman Briton Allen has been getting reps with the second team. Aside from that, USC is mainly relying on walk-ons at corner. Defensive coordinator Clancy Pendergast described Johnson as more of a “work-in-progress type guy,” but having him in the mix is better than not for the Trojans. Running back: Vavae Malepeai, Stephen Carr, Markese Stepp. Receiver: Michael Pittman, Tyler Vaughns, Amon-Ra St. Brown. Offensive line (left to right): Austin Jackson, Alijah Vera-Tucker, Brett Neilon, Andrew Vorhees and Jalen McKenzie. Some offensive notes: Stepp was the only healthy scholarship running back at practice this week. Carr and Malepeai have been nursing injuries. … Sophomore receiver Devon Williams isn’t listed as a starter, but he’s been impressive this spring, and with Velus Jones still in the transfer portal, Williams will likely be the team’s fourth receiver. But truthfully, with the depth concerns at defensive back, it’s difficult to gauge the true progress of the receivers this spring since they’re competing against walk-ons a lot of the time. Defensive line: Christian Rector, Jay Tufele, Marlon Tuipulotu, Connor Murphy. Linebackers: Palaie Gaoteote, Jordan Iosefa. Safeties: Talanoa Hufanga, Isaiah Pola-Mao. Corners: Greg Johnson, Isaac Taylor-Stuart. Some defensive notes: John Houston has started the past two seasons at inside linebacker and is expected to remain a fixture in that rotation if he doesn’t end up a starter. … If Hufanga’s tweak turns out to be something serious, walk-on safety Jordan McMillan, who intercepted a pass in the Notre Dame game, is another option at safety, and so is Raymond Scott, who came to USC as a linebacker. Backup safety C.J. Pollard has been at practice but has often had a boot on his foot. … Sophomore Olaijah Griffin isn’t available this spring but projects to start whenever he returns. Last year didn’t work for USC, all around. Wouldn’t any reasonable coach make some drastic changes to prevent that from happening again? I just assume that because coaches that get fired from big-time jobs might find themselves put out to pasture way too early. Plus Graham Harrell is calling the shots on offense now, and if Clay Helton creates friction there, he could find himself looking for a new OC again quickly and that would reflect very poorly on his future IMO. I guess everyone sees things differently. I read one writer felt Fink was #1 having the best spring but this writer takes JT, yet you keep hearing about Sears does this or does that. I don’t think spring will give us a starter, it is going into fall camp before they announce. Helton again will be slow to make a decision. I think JT Daniels will hold onto his job, but I’d love to see Fink or Sears get it. Would make things very competitive and I think USC football needs that to the max. Are Fink & Sears not up to the challenge? Its early still and we just want the best QB to get the nod. Someone’s observation should be trained on how fair Harrell actually is in giving each QB the same reps and with the same recievers until a clear winner comes out of it? I trust GH to make the right call. He has no history of favoritism or weird USC QB choices. From the film clips I’ve seen of him, he’s clearly unbiased, having fun and putting all of USC’s QBs through their paces. I’m a lot more worried about USC’s depth issues at certain positions and ingrained unaccountability than I am GH getting it right at the QB spot, his specialty. Yes. The depth issues are a real concern. I was hoping we would get another safety and corner in the portal but I’m not sure we will. We also need at least 1 more Offensive Guard. Injuries will crush us.